This article will be used by Administrators, selected staff members, and teachers who wish to approve parent accounts. Note: SchoolLoop can disable teacher access to this feature for districts that require it. Contact SchoolLoop for more information. Click on the User Management drop-down menu at the top left of the portal homepage. Administrators may grant approval rights to specific staff users. Those staff members will see an Approve Parents link in the Quicklinks section located at the top of the right column of the portal homepage. Staff members may not disapprove parent accounts. Teachers may only approve and disapprove the accounts of parents with students enrolled in their classes. 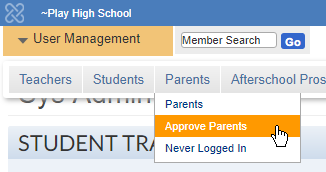 Click the Parent Directory link in the Toolbox located at the top of the right column on the portal homepage and approve/disapprove accounts as needed.